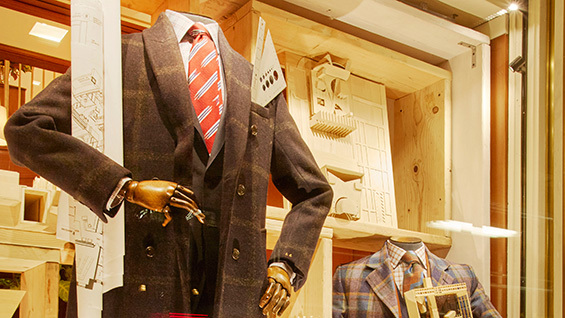 Walk past the Turnbull & Asser store on East 57th Street and you may be surprised to see authentic architectural models in the window, lending authenticity to a collection of menswear suited to the well-dressed architect. The models are by students at The Cooper Union, prepared last spring for the fourth-year studio, which explores the relation of institutional architecture to urban networks and public space, among other topics. Featured in the annual End of Year Show, they were showcased in the windows of the Bowery-facing colonnade of the Foundation Building in a display created by Professor Diane Lewis. 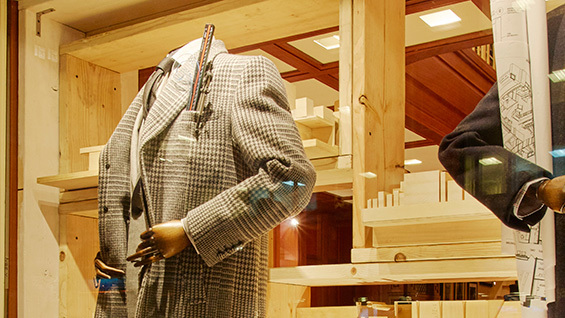 When Zander Schneider, director of design at Turnbull, the New York store of the well-known British men’s clothier, conceived the idea for his window, he called the Irwin S. Chanin School of Architecture. The success of the End of Year Show windows made Lewis the obvious collaborator. 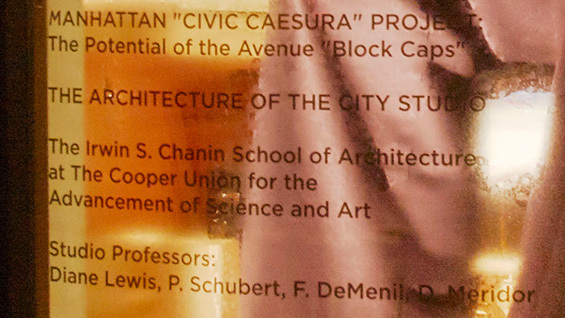 Last year, the studio run by Lewis, Professor Peter Schubert, instructor Daniel Meridor, visiting assistant professor Daniel Sherer and architect Francois deMenil challenged students to create a vertical structure substantial enough to encompass a series of diverse programs that would “cap” the short block along a Manhattan avenue, while at the same time framing an implicit architectural continuum with a major landmark across the avenue. Students whose work is included in the Turnbull & Asser display are Aimilios Davantlis Lo, Jorge Flores, Sam Koopman, Kelsey Lee, Piao Liu, Hui Rong Liu, Hugh Scott Moncrieff, Stephanie Restrepo and Kyle Schroeder. The school, the studio and the individual students are credited as part of the display. The display will be in place at 50 East 57th Street until November 11. Student projects produce during 14 years of the fourth-year studio were also collected in Open City: Existential Urbanity, edited by Diane Lewis and Daniel Meridor and published by the Irwin S. Chanin School of Architecture in 2015.